Below is the eulogy that I gave at my father’s burial service on October 1, 2003, in my home town of Martinsville, VA.
My father won’t have any buildings or roads named after him. But if we measure a man’s success from where he started to where he finished, my father was a very successful man. I’d like to tell a story. On Christmas day 2001, my sister Joyce gave my sister Billie and I a gift of a photo of my father when he was a little boy. It is the only photo from his childhood we’ve ever seen. He was about twelve years old, standing in front of a unpainted clapboard shack. It was his home. His father was an alcoholic who abandoned the family during the depression, leaving his mother to raise seven children with no financial support. My father never spoke of his father. From that beginning, my father — along with my mother Ruth — created the wonderful home at 2 Hampstead Place. He worked hard to provide his children with so much he never had. He put all three of us through college. If I look at my father in the light of where he started and what he accomplished in his life, he was a very successful man. Here’s the photo that Joyce found. 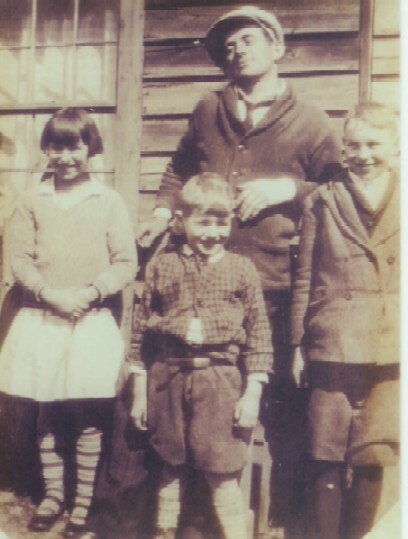 (My father is on the right; his younger brother is in the center and his sister Nellie is on the left. In the back is a cousin who was visiting.) Every picture tells a story and this one tells me so much about my father’s childhood (which he was very reluctant to discuss). If I had really understood how he grew up and the implications of that experience, I would have appreciated his success more and forgiven his mistakes more readily. Very nice words. I always remember your father as very reserved and quiet, always polite and always strong. Both of our parents gave us so much more than they ever had and I believe they enjoyed doing it. It a good feeling to know that we never really let them down in any big way, kept our noses clean and did not shame their good names and hard work. Although I was there & heard this, thanks for sharing it here. It was very touching to read. I’ve printed it to send to my sister in NC. The younger brother, Bud, was the one I leaned on when my father passed away. He was always there for me, taught me to drive, & saw me through my teen years when Mom was struggling with alcohol. I guess I was the daughter he never had. Next Next post: Global Warming: Is Nuclear Power Green?